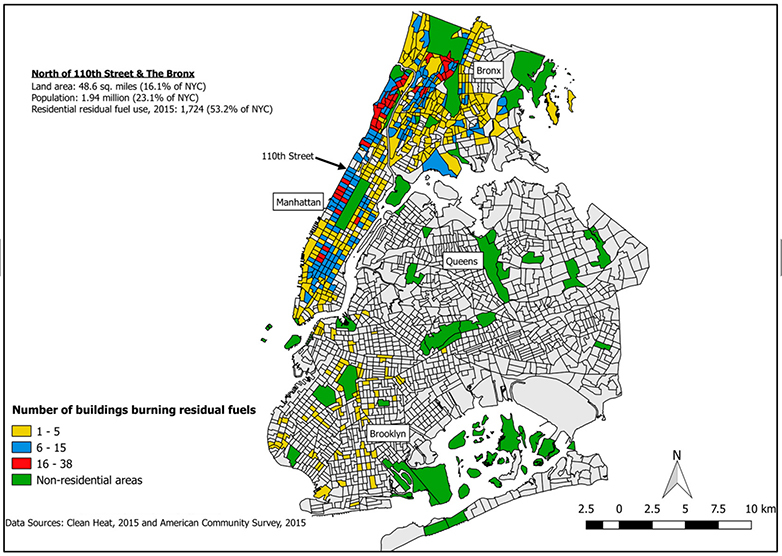 Residential buildings in New York City that burn residual fuel oil were concentrated in Northern Manhattan and the Bronx, as of late 2015. Compared to cleaner heating sources such as natural gas, these dirty fuels produce high levels of particulate matter, exposure to which is linked to asthma, obesity, developmental delays, and other health problems. Results of the study by researchers at Columbia University’s Mailman School of Public Health appear in the journal Environmental Research and Public Health. New York City’s Clean Heat Program was launched in 2010 to eliminate the use of residual diesel fuel oils—diesel-based fuels that remain after gasoline and distillate fuels have been removed from crude—in residential buildings, in order to help address city air pollution levels that historically failed to meet the minimum criteria for federal Clean Air Act standards. Under the program, residual fuel oil #6, the dirtiest type, was banned in 2015. According to city data sources, as of November 2015, only 19 residential buildings were still using this fuel type, including 10 buildings in the Bronx, eight in Lower Manhattan, and 1 in Queens. Residual fuel oil #4, which won’t be banned until 2030, continued to be burned by 3,253 residential buildings, despite the city’s efforts to educate and incentivize owners to switch to cleaner fuels. Of these buildings, 1,724 or 53 percent were clustered in Manhattan north of 110th Street and the Bronx—disproportionately higher than the area’s population (only one-fifth of city residents live in these neighborhoods). To assess the workings of the Clean Heat Program, the researchers interviewed policymakers and officials, building owners and managers, an independent heating oil distributor, and bank lenders specializing in green development. These interviews shed light on reasons why some buildings continue to burn residual fuel oil. Building owners and managers explained that they were inundated with information from companies claiming to have fuel options that comply with laws and save them money, leaving them overwhelmed and distrustful. Several said they were uncertain about which fuels were the cleanest (for some, natural gas was perceived by some as dirty due to its extraction from hydro-fracking). The cost of conversion was a factor for many buildings, despite the Clean Heat Program’s financing options and incentives. Many owners and managers also worried about market volatility around natural gas pricing compared with prices for residual oil, which they knew to be stable and historically less expensive than other fuels. Of buildings that transitioned to the cleanest fuels, 89 percent were buildings with many units. According to the researchers, larger buildings are potentially more likely to have access to financial resources than smaller buildings. The researchers recommend that policymakers consider new incentives to catalyze the conversion of New York City buildings that continue to burn residual heating oil. These might include greater financial incentives, particularly for low and moderate-income buildings. They also raise the possibility of a building energy rating system. Implemented throughout much of Europe and similar to the Department of Health and Mental Hygiene’s system of grading restaurants, such a system would inform community members about the status of buildings in their area. “If more residents knew their building was burning dirty fuel that was bad for the health of their families and their neighbors, they might be more likely to push their landlord to switch to a clean alternative,” says Diana Hernández, PhD, the study’s senior author and assistant professor of Sociomedical Sciences at Columbia’s Mailman School of Public Health. The study was also co-authored by W. Victoria Lee, formerly in the Department of Environmental Health Sciences at Columbia’s Mailman School of Public Health. Funding was provided through grants from the National Institute of Environmental Health Sciences (ES0241080, ES009089, ES023770) and a JPB Environmental Health Fellowship granted to Diana Hernández and managed by the Harvard T.H. Chan School of Public Health. The authors declare no conflicts of interest.